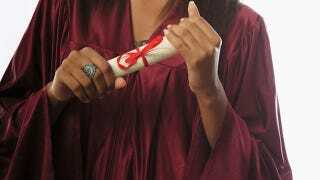 An Arkansas high school student is suing her school after they made her share the valedictorian spot — allegedly because she is black. Defendants did not support African-American students, and did not want to see Wimberly, an African-American young mother as valedictorian. But for Wimberly's race, defendants would not have selected a student with a lower G.P.A. than Wimberly to also be a valedictorian. For a student to be valedictorian or salutatorian, he/she must be an honor graduate. Students must be continuously enrolled at McGehee Secondary School the last two semester without transferring during this time to be considered in class ranking or eligible for valedictorian or salutatorian status. It's unclear whether the principal was referring to either of these requirements — the district has not yet responded to our request for comment. The complaint also alleges that "African-American students were not encouraged to take Honors or Advanced Placement classes. Caucasian students had to almost opt out of the honor's track." McGehee last had a black valedictorian in 1989.